secondly its relevance to consumers and their behavior. As it is just a statistical process, cluster analysis attempts to group the data that is provided on the basis of Euclidean distance between the points. Through its calculations it tries to find segment/groups that minimize this distance (or SSE). Therefore, it is important that the data provided has some logical order to it. It is very important to note that you cannot use a nominal data scale. An example of a nominal scale is gender – where male = 1 and female = 2. Cluster analysis cannot make sense of the distance. It is not something that can be averaged – we cannot have a market segment that is 1.4 male for instance. You need to use data that it is in some form of order – usually in an ordinal scale or an interval scale. An example of an ordinal scale could be age group – where 18-24 = 1, 25-34 = 2, and so on, perhaps up to 75+ = 7. When we use an ordered scale, then it makes more sense to the cluster analysis process – we know that seven is the oldest age group, or we know that five is a little bit older than four and a lot of older than one. An example of an interval scale would be a one-nine scale to measure customer satisfaction, where there are perceived equal distances between each data point. I would recommend against using real numbers in your calculations. An example here could be income levels. Rather than using a respondent’s actual income level, simply group them into an ordinal scale (like the age group example above) as they would be more helpful for the cluster analysis calculation. Therefore, generally you should try to use data that is in some form of scale – such as 1-5 or 1-9 or something similar. For more information on scales, please refer to this external reference for a basic discussion of data scales. Keep in mind that the end result is to form market segments that are useful in developing marketing strategy. Therefore, various psychographic, attitudinal, behavioral descriptions of the consumers would probably yield the best results. This is because we want to create a good understanding of how consumers think and act – we are less interested in their demographics (but we should include demographics in the end segment profile). Remember to ensure that these marketing variables are at least scaled on an orderly (ordinal) basis – as discussed above. 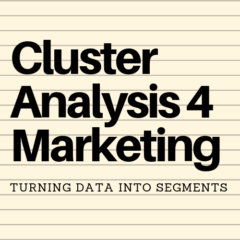 The combination of these factors, when used with cluster analysis, should yield some interesting market segment possibilities. More information on consumer descriptors and segmentation bases. For further information, below is an excerpt from the Market Segmentation Study Guide that outlines the main choice of segmentation bases. If you continue reading it will take you to that site and you will need to hit the back button on your browser to return to this page.